Wild and pet rats are omnivorous and eat a wide range of foods from both plant and animal sources. Rats enjoy many types of food, but because each rat has her own preferences, providing her with a balanced, healthy diet is up to you. Rat nutritionists typically recommend that about 80 percent of your rat’s diet consist of fortified food mixes or rat blocks, and 20 percent be made up of fresh foods. 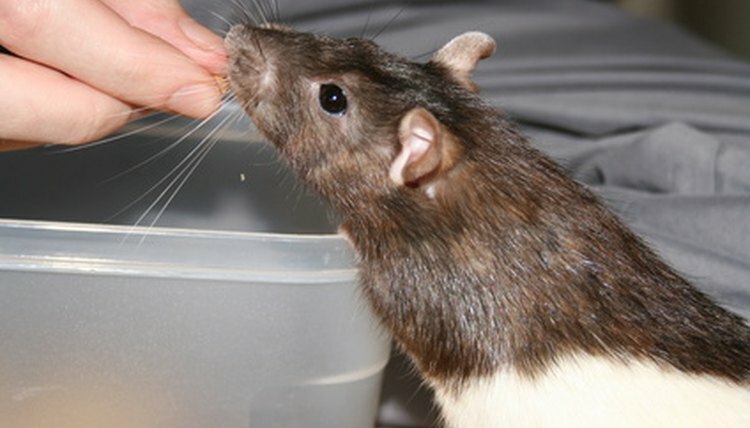 You can feed your rats most but not all fruits and vegetables, as well as small servings of animal proteins, such as hard-boiled or scrambled eggs and cooked fish, chicken or other meats. Eggs are a complete protein, and they also contain A, D and B vitamins, and minerals, such as phosphorous, zinc, iron, potassium, iodine and sulfur. The whites of hard-boiled and cooked eggs are a highly digestible protein source, because the body can retain all of the protein from eggs. Digestible proteins are relatively easy for rats to absorb so small servings of hard-boiled eggs offer rats a nutritious and tasty source of protein. Introduce small portions of new foods gradually to allow your rat to try different flavors and to avoid upsetting your rat’s digestive system. Pregnant and lactating mother rats need additional nutrients while carrying and feeding their young. For example, they require a diet higher in protein than other adult females or male rats. Healthy protein-rich sources include hard-boiled eggs, scrambled eggs, chicken and organic, unprocessed soy products. Feeding a low protein diet to a pregnant or lactating rat may cause a reduced lifespan for some of her offspring, so it is important to provide the appropriate amounts of protein and fat that are so essential for the health of the mother and her growing babies. Baby rats who are being weaned and beginning to eat semi-solid foods have different dietary requirements than adult rats. Babies need more protein, which you can provide by offering them a soft mixture of soy baby formula or soymilk mixed with baby cereal. You can combine hard-boiled eggs and soymilk in the blender to create a mixture baby rats can lap from a small bowl. When your young rats are ready for rat blocks or fortified food mixes, be sure the commercial foods your feed them are made for young, growing rats and not for full-grown adults. A nutritious, low-calorie, low-fat diet will maintain your rat's health throughout her adult life. A grown rat's diet should consist primarily of rat blocks formulated for different life stages or fortified food mixes specifically for adult rats. Fresh fruits and vegetables are essential to their daily diet, and you can offer your rats small amounts of dairy products, cooked eggs, fish or chicken. Whole hardboiled eggs offer an exciting and entertaining treat for rats of all ages. To prevent fresh food from spoiling, remove any uneaten produce, eggs or dairy products within three or four hours and any leftover meat morsels within one hour.